iDiski - Soccer Blog and Football News world news Javier Mascherano Made Another Biggest Mistake That Cost Argentina A Win. Javier Mascherano Made Another Biggest Mistake That Cost Argentina A Win. Javier Mascherano is a good player there is no doubt about that, over the past 7 years he have been the best player for both FC Barcelona and his country Argentina. One mistake can be overlooked and standard that players are also human beings meaning they are allowed to make mistakes. 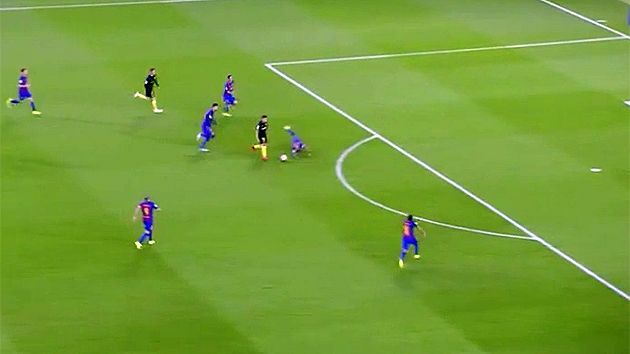 Against Atletico Madrid Javier Mascherano had a chance to clear the ball as he was playing as Barca Center back together with Gerald Pique but he was well beaten in a way that he even felled on the ground leaving the striker with one option to score. Understanding so he was heavily criticized by Barcelona fans all over the world by his blunder, but he was on again in this morning wearing the Argentina uniform. He had so much time on the ball to think carefully make a good pass instead he chose to play it back but making a wrong pass straight to the striker. The last defender had to do something unlucky he followed the striker and that resulted into a penalty and Peru made no mistake they equalized and the game ended with a 2-2 draw. You could tell that Mascherano was disappointed based on his body language. The last defender had to do something unlucky he followed the striker and that resulted into a penalty and Peru made no mistake they equalized and the game ended with a 2-2 draw. You could tell that Mascherano was disappointed based on his body language.